Split wood the easy way with the Splitz-All! The Splitz-All manual wood splitter provides the wood splitting capacity you need at a price you can not refuse. Considering the safety it brings to your family members. The Splitz-All is the safer and more effective way to split wood, without the hidden dangers and challenges that come with traditional manual wood splitting tools. Easier and safer than traditional manual wood splitting devices, the simplicity of the product makes it a good tool for men, women, even children. 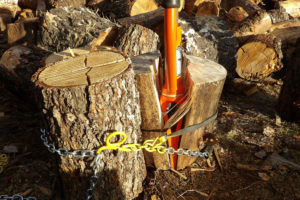 By minimizing the effort required to split wood, you can avoid fatigue-related safety issues, as well as increase your wood splitting productivity. Best way to split wood EVER. Look at this split. How do you use the Splitz-All? Simple, all you need is to point the bottom wedge of the device onto the log you wish to cut. Then press down on the handles, and in no time you’re the mayor of wood splitting city. So simple that even a small child could handle it. The Splitz-All makes manual wood splitting a breeze, saving you time, money and energy, along with ensuring your safety when splitting wood. Who can use a Splitz-All? Everyone! Even for those who cannot, or do not want to, use traditional manual wood splitting devices such as an axe or a maul, the Splitz-All is the perfect solution to your wood splitting issues. It is so physically easy to use that even a small child can handle it. This safe manual wood splitter doesn’t require any special physical strength or stamina to operate. The Splitz-All is available in four sizes; small, medium, large and X-treme. The small Splitz-All is the perfect wood splitter for children, the elderly, or just for those splitting smaller logs. The medium size is perfect for everyday use. The large Splitz-All is for men to use daily, and the X-treme is used for heavy duty use and for extra large logs. 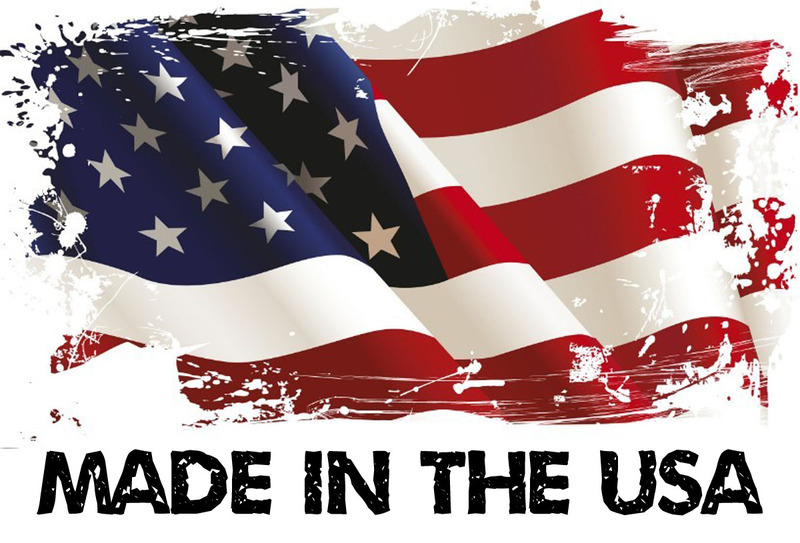 For the winning combination of safety, ease of use, variety of sizes, and value for your dollar, the Splitz-All line of safe manual wood splitters. The solution to all of your wood splitting problems! Many folks like to cut wood as a peaceful exercise. It can also be exhausting work. But, not with the Splizt-all! With the Splitz-All, you break through the logs and continue without feeling the need to stop. What is the secret to cut wood with the amazing Splitz-All? 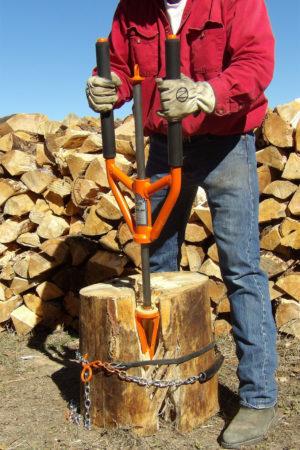 Splitz-All makes natural use of gravity to help people split firewood in a hammering motion. The Splitz-All lifts up and hammers down on logs. As the hammer lifts up, you force it down into the wood, which eventually shoves a wedge all the way through, cutting the wood. You can even safely split firewood from multiple logs higher up. Tested next to a traditional ax wood cutter, it is safer and easier to do the same work. You do not have to worry about children getting in the way or missing while you are swinging and ax/maul. With the Splitz-All, you hit the same place in the wood every time without trying. 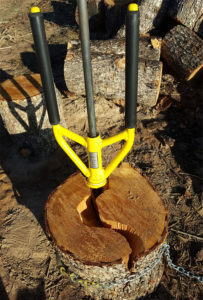 In addition, you can let your children or older family members cut wood because Splitz-All does not require the strength or safety concerns that an ax might have. You can split even easier with the Splitz-Assist, which is a chain and bungee combination that serves to keep the log together as you split. When you finish cutting the firewood, you simply pick it up and carry it to the wood pile. Different sizes for different applications to cut wood. You can buy the Splitz-All in four different sizes: small, medium, large and X-treme. Small was intended for the smaller logs, children or elderly; medium was intended for women to split the average everyday sized logs; large can be used by men in splitting daily and the X-treme to be used to assist with the largest applications. The large Splitz-All has split an 8′ x 24″ diameter oak log. This invention lets gravity do most of the work. When you purchase any of these products, you receive the Splitz-Assist included FREE as part of your package. There are many downsides to traditional methods of wood splitting. When swinging an ax, there is always the risk of pulling your back muscles or causing other injuries. Not so, with the Splitz-All. Also, many people rely on power tools to cut wood. With the Splitz-All, you never have to rely on power tools again. The advantage is that you do not have to worry about power tools being charged or the battery running low. 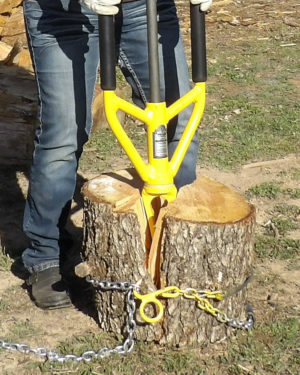 The Splitz-All has a great design, and it is a fantastic tool for everyone and for every firewood cutting job. The company that invented the world’s easiest wood splitter, the Splitz-All, is excited to announce its new, completely re-vamped, website! Enjoy! We are excited to share with you our journey.